Squatting toilets- they’re everywhere unless you go to expensive westernized businesses. And they’re actually not that bad or that difficult to use- once you get down the Asian squat. They’re even more sanitary than western toilets in a way, although they can stink up a bathroom a lot. The Asian squat- it can be difficult for westerners, but it’s the key to be able to use squatting toilets. Asians plant their feet slightly wider than shoulder width, and then sit down on their feet, keeping their heels completely flat on the ground. It’s more stable and comfortable than how westerners squat since their heels are planted instead of raising their heels like westerners. 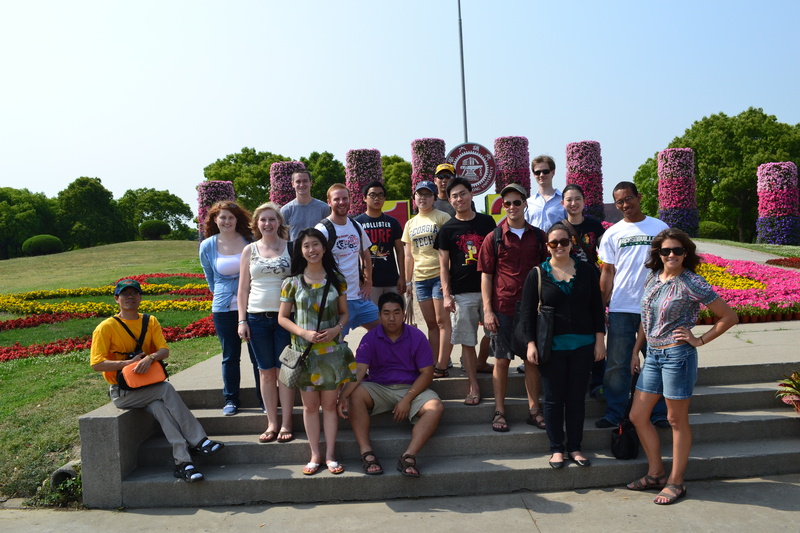 In fact, Asians tend to squat like this everywhere to sit down or rest a little because it’s so comfortable for them. They have a unique pace to their life in Shanghai. 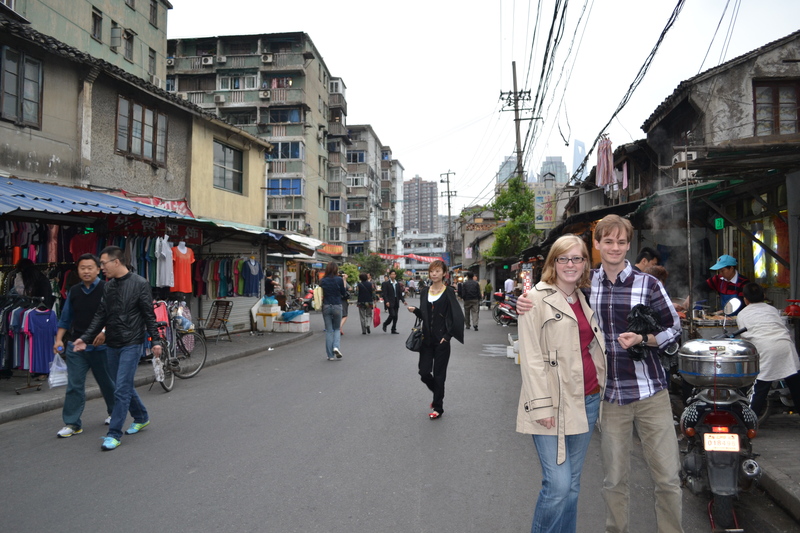 Shanghai is a huge business center for China, and as such has a very fast-paced business feel to it in places. But the Chinese balance the business pace to their lives much better than I have seen in the western world. Once the Chinese are done with their workday, they slow down and enjoy a cup of tea, go for a walk, or even do tai chi- sometimes while still in their business clothes. It’s essentially a part of their culture. They have so much history and depth to their culture, and part of that is respecting people slowing down their lives and taking care of their health. It’s really interesting to observe. Along with busy workdays, and resting and relaxing after work, there is a very active night-life in Shanghai as well. Between restaurants, clubs, and karaoke there’s always something to do at night in Shanghai. 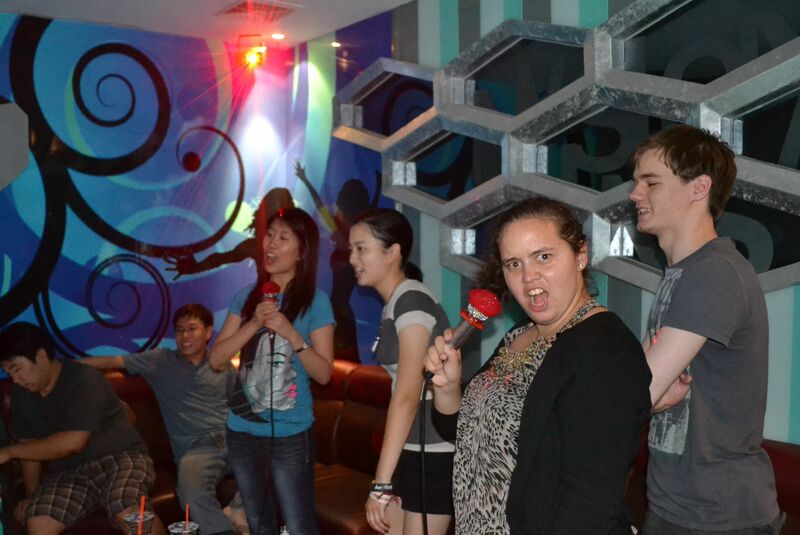 I had some of the most fun in China in the evenings going to sing karaoke with my friends. It’s inexpensive and also extremely entertaining. Unfortunately, China is pretty dirty. You can’t help but notice all of the grime as you’re walking down the street. And if you have to walk outside when it’s raining and you’re wearing long pants, you’ll probably want to cuff the bottoms to keep the rain from kicking up grime onto your pants. Also, the air in China is highly polluted. One of the things I missed the most while I was abroad was a full breath of clean, fresh air on a sunny day. 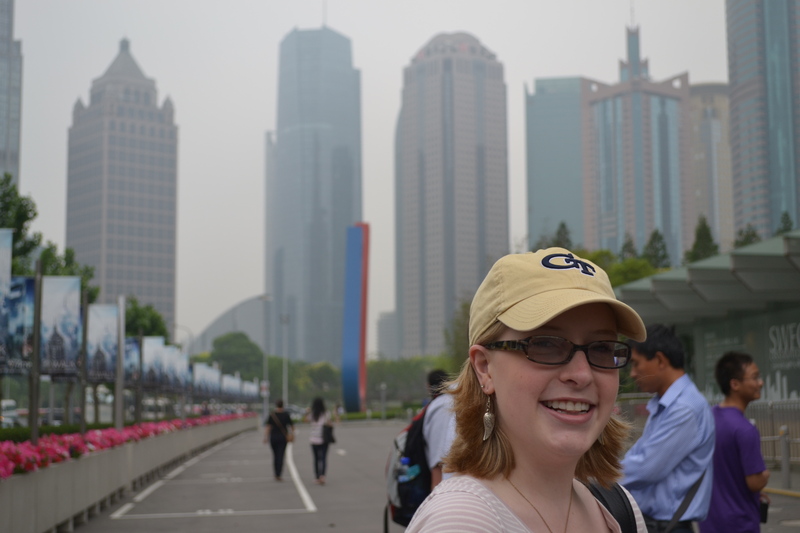 Occasionally the polluted air and dirty streets do make walking around China slightly smelly. But if you are walking down the street and it suddenly starts smelling really badly- like manure- it’s not actually manure, or even the dirt in the street. That smell is actually food. Stinky tofu to be exact. And Chinese people love it. Rest assured, it doesn’t taste like it smells- in fact I tried it myself and I have to admit it wasn’t bad. All of these were just a few of the things that I noticed about China while I was there. It’s a beautiful country with a rich history and culture, and I thoroughly enjoyed every minute of my time there. 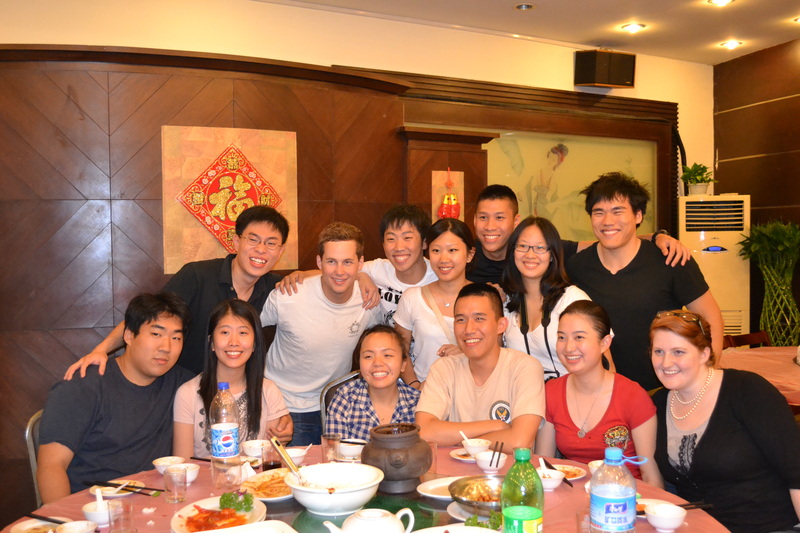 I got to experience the daily life of people in China, eat tons of new foods (yum! ), and my Chinese abilities increased dramatically. If you were wondering from the title of this post if I was really dreaming in Chinese, I can say that yes, sometimes I was. All in all it was an amazing experience, I can’t wait until the day that I’m able to go back. 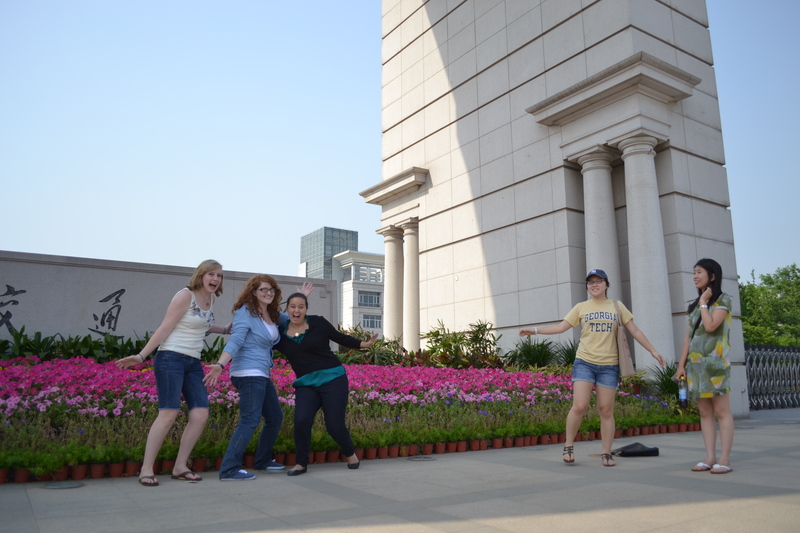 Of course, as part of our trip to China, we’ve gone shopping a lot. And I must say, shopping is an interesting experience in Asia, and one I’ve grown to love. You see, most places you go in China aside from big stores and malls, you get to haggle down the price of things you want to buy. Haggling is a huge part of the culture here in China- I’ve learned you can even ask for a discount in the big recognizable stores. And it never hurts to ask- worst case they say they can’t give you a discount, but they still really want to sell whatever it is to you. In the time we’ve been here, we’ve gone to both the fabric market and Qipulu several times, both of which are places where you haggle over everything. The fabric market is three stories of little shops of tailors and seamstresses who can make just about anything clothing-wise. This first picture is of one of my classmates and I just outside of the fabric market. Several of my classmates went in to various shops and had business suits made for them. These suits are of a really good quality, too. In these shops you’re able to choose the fabric you want the suit made out of, the design and cut you want the suit to be, and then they measure you and make a suit specifically tailored for you. You can even talk to them about the various ways you want the suit to fit and how you want the finished product to look. While we were there, I didn’t order a suit myself, but I did order a qipao to be made for me. In case you don’t know much about Chinese culture, a qipao is the traditional Chinese style of dress. Mine is knee length, in a bright red fabric that the shopkeeper told me was unique to his shop and couldn’t be found anywhere else (and we do believe him on that- these shops are incredibly competitive so he would have to be able to back that up). My qipao is also trimmed in a double layer of black ribbon. And just like the other products you can buy at the fabric market, it is tailored specifically for me and fits perfectly. I love the finished product. 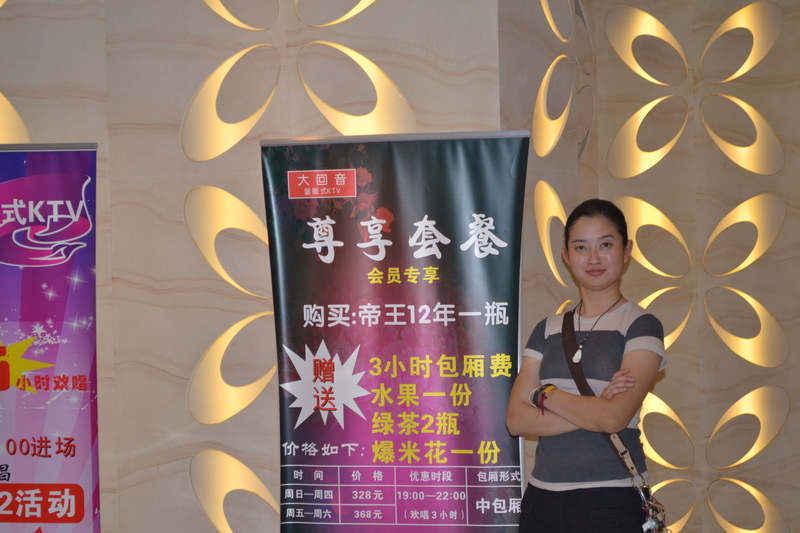 We recently went to see the Peking Opera (traditional Chinese opera) and I got to wear my qipao there. 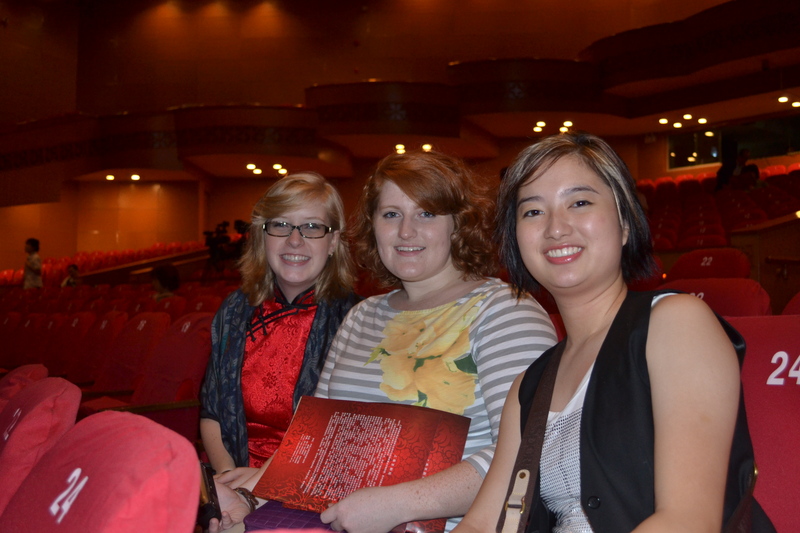 I’ve included a picture of me and two of my friends in the theater when I was wearing my qipao. I also love going to Qipulu here. Qipulu is made up of around 3 to 5 big buildings (I’m not sure exactly how many there are because we’ve still only explored a few of them). These buildings are several stories each, and are filled with these tiny little shops selling everything from shoes, to clothing, to purses, to sunglasses, and many, many other things. I’ve included a picture of one of the stores in Qipulu- I thought it was really cool because to save space in the shoe shops they typically each have a ladder and a little hole in the ceiling- and up through that hole is where they store all of the extra sizes of the various shoes since they can only display so much out on the floor. The best part is haggling. Haggling can be extremely satisfying when a shopkeeper quotes a certain price at the beginning and then after successful haggling you get them to cut the price by more than half. There is a lot of strategy to haggling, however. At first you tell them the price they’re quoting is way too expensive. After that they will generally ask you to name the price that you want. This is probably one of the most important parts- since once you ask for a certain price you won’t be able to get away with asking for a lower price. A good rule of thumb is to try cutting the price in half or a little more than half at first. But always, if you think asking for a certain price is good, go lower. Once you cut the price a shopkeeper will tell you they can’t sell that low. And gradually you come up bit by bit as they lower the price they’re offering. Sometimes though if they aren’t bargaining much, the best thing you could possibly do is to walk away. Most times they’ll run after you yelling okay because they want to make a sale. And eventually you’ll know that you’ve gotten to a good price when they gruffly agree to it and hand you the item. Generally that means you’ve gotten to the point where they’re not making as much profit but are desperate to make a sale. Sometimes they want to make a sale so badly that they practically give you an item. One time as we were looking at clothes I was looking around but obviously not buying anything. My friends bought a lot of clothing, though. Eventually as they were bargaining with the shopkeeper, she looked over to me and pulled out a dress I had looked at and told me she would give it to me for less than half the price- which was less than 10 US dollars. Of course I took it- she was practically giving it to me at that point. And that’s part of the fun of haggling- at the end of the day you may not have gotten one of the things you really wanted because you had to walk away, but you look and see that you did get some really cool things at a steal of a price because you successfully haggled. Alright, I’m not going to lie. I love food. And I love to eat. Give me any sort of delicious food and I will be one happy camper. And here in china I’ve been able to experience some pretty delicious food. First of all, food is dirt-cheap here. I’m talking my breakfast is around 50 cents and my lunch is usually around a dollar (in US dollars). And it’s like that most places we go. I don’t think I’ve paid more than 10 dollars for a meal here in all of the places we’ve gone to eat on our own. And it’s generally pretty delicious food too- or as we would say in chinese- 很好吃- or very good to eat. I’m loving the food here, and I think that will be the thing I miss the most once I’m back in the States. But even better than the meals we have on our own, are the meals we have as a big group. We generally have around one to two of these “group dinners” a week, and they’ve been a ton of fun and we’ve tried some really great food. These first two pictures are from a group dinner our first week of the LBAT. 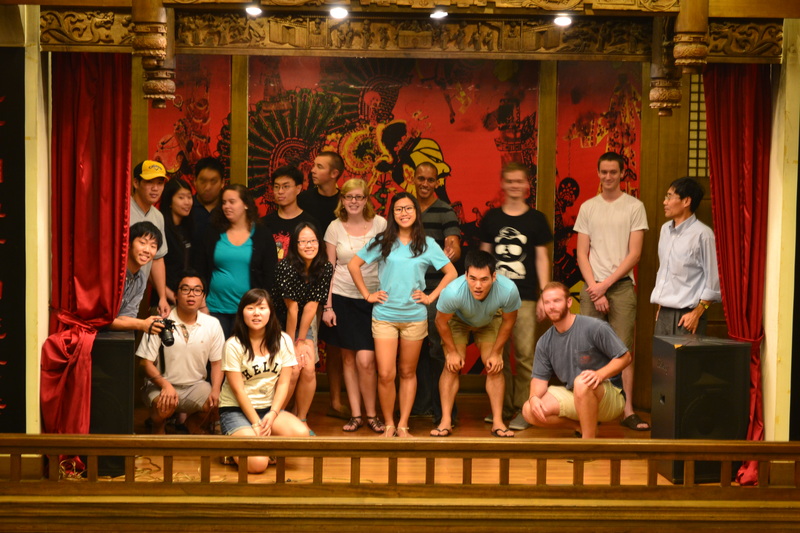 My favorite group dinner, however, was when we went to a restaurant named Sichuan Folk. We got to try some Sichuan-style food, which, in case you don’t know anything about the various regions of China, is famous for being incredibly spicy. And in case you don’t know much about me, I love spicy food. But this was a whole new level of spicy for me, and while I really enjoyed most all of it, I do have to admit one dish was the spiciest dish I’ve ever eaten. At one point it had me wondering for a few minutes whether I had accidentally crossed my personal line into the level of dangerously spicy. But after drinking a lot of tea and eating less spicy food, it subsided into a general burn in my mouth with a few parts of my mouth being numb. 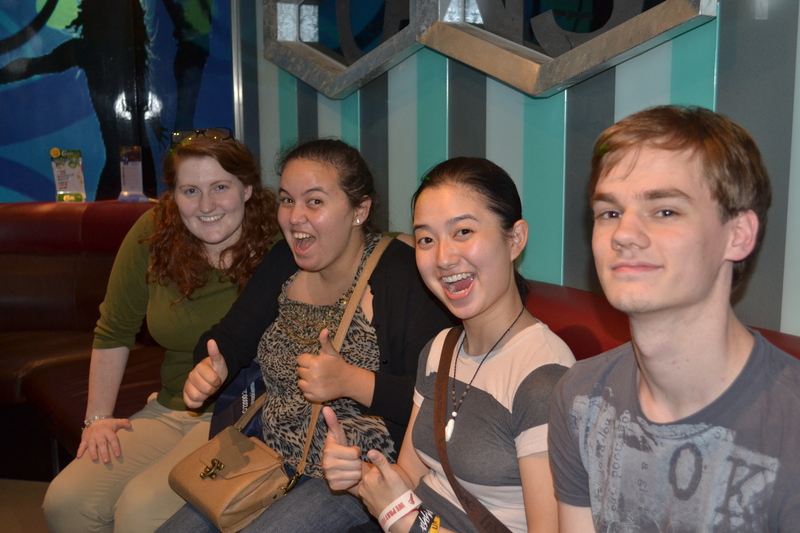 Aside from that, the dinner was really fun, and I loved all of the food we tried. And I learned my lesson not to eat the peppers and their little black seeds that come with some of the spicy beef. 😉 The restaurant we went to looked really cool inside, and so we all had a bunch of fun looking around and taking pictures at dinner. Here are a few of mine. In Asia, karaoke is really a part of the culture. If you want to go out and have fun, you go sing karaoke. In China, there are a bunch of karaoke places around where you go and book a private room for you and your friends for a few hours. Here, we went to KTV. It’s relatively cheap, and incredibly fun. Inside the karaoke room, excited to start! I personally love karaoke, or in Chinese 卡拉OK (kalaOK). It’s always entertaining, and you get to experience some pretty funny moments with your friends, like how I caught my friend Cristina making a cute, funny face while singing in this picture. It really never gets old, and I would highly recommend it to anyone wanting to have a fun night. 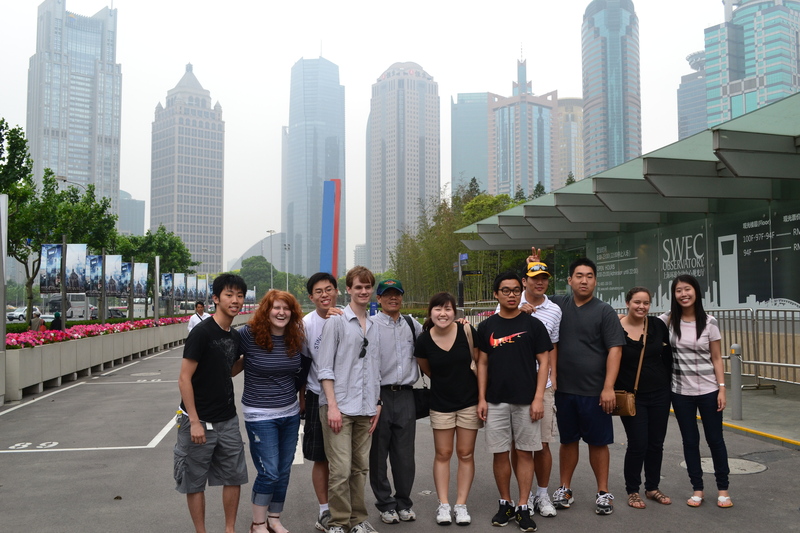 As part of the LBAT, our group gets to make a few visits to businesses in Shanghai. We recently visited bao steel; I would be making an understatement if I said that it was any less than incredibly interesting. When our bus arrived at Bao Steel they told us a little about the history of the company, including the fact that they are the second biggest steel producer in the world! Then as soon as we stepped off the bus we were each handed a hard hat, and walked into their factory to watch the process of producing steel. Their factory appeared to be several massive warehouses. Once inside we went up a couple of flights of stairs to observe the steel production from a catwalk lining the buildings. The man giving us a tour of bao steel had said that it should be a relatively nice day to tour the factory because it wasn’t too hot and their steel production could get to be extremely hot. However, as we walked into the warehouse it was like walking into a wall of heat. And this was cool for them! We watched the part of steel production where they took a huge, red-hot block of steel and thinned it out to be paper-thin, then cooled the steel, and finally bent it into giant rolls of steel. Seeing the red-hot steel pass us and go through various machines, giving off tremendous blasts of smoke, was pretty cool, to say the least. At one point, a really long thinned-out sheet of steel passed by us and you could feel the heat radiating off of it on our skin several seconds later! Overall, the tour was extremely interesting, and I think we all got some pretty cool pictures of the steel being produced, including this group picture of us outside of the factory.